How to Color Asphalt Pavement? 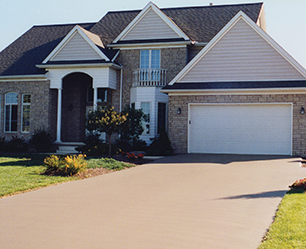 Adding color to asphalt pavement has become very popular in recent years. Reasons for coloring asphalt pavement include reduction of surface temperatures (cool pavement) to reduce urban island heat, the aesthetic value that color brings to pavement, and providing vehicle and pedestrian flow through color-coded pavement areas (bus lanes, bike lanes, walking paths, etc.). One method of colorizing asphalt pavement involves adding dry pigment to the hot asphalt blacktop mix. 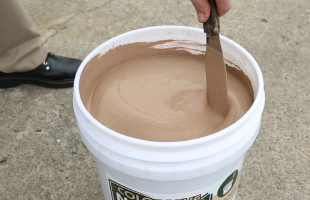 This method is costly and typically results in only dark “earthy” colors that do little to reduce surface temperature. The most effective method for colorizing asphalt pavement is to apply an acrylic based color coating. Acrylic color coatings allow for exact colors including light colors that are highly reflective. Light reflective colors may also provide LEEDS credits for reducing urban island heat. 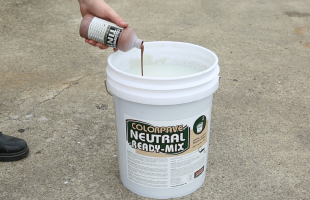 ColorPave from SealMaster provides the ideal solution for color coating asphalt pavement. ColorPave is a 100% acrylic emulsion fortified with slip resistant aggregate that is available in many different colors. ColorPave is designed for use on parking lots, driveways, walking paths, golf cart paths, and more. 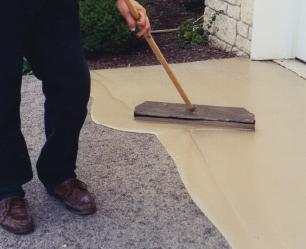 ColorPave is easily applied to pavement surfaces by squeegee or spray application methods. ColorPave is available at SealMaster locations nationwide. SealMaster also offers Safe Ride Green for bike lanes and Safe Ride Red for bus lanes.